Members of the Delta Delta Delta compete in Greek Sing on Sunday in Lantz Arena. 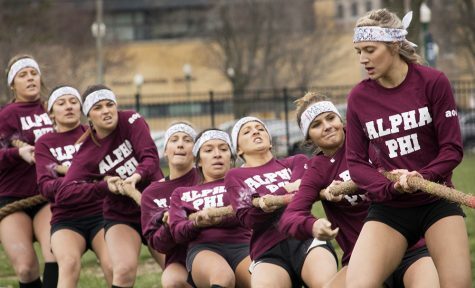 The sorority won the competition for the seventh straight year. 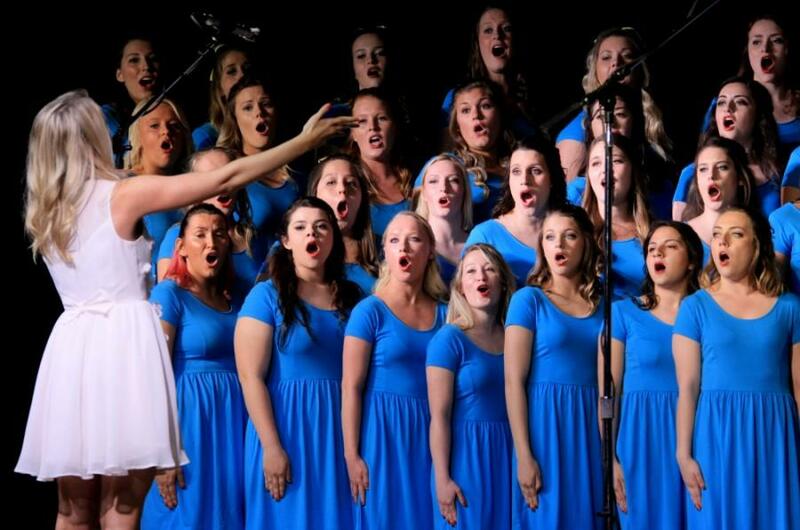 Members of Delta Delta Delta sorority hit the right notes, securing first place in Greek Sing, a choral competition, for their seventh straight year Sunday at Lantz Arena. 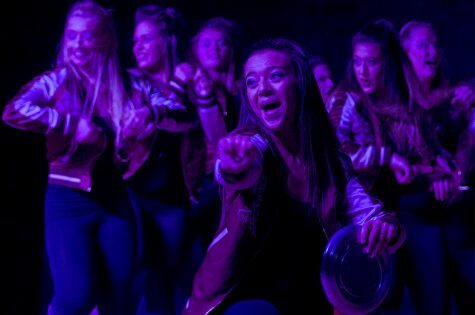 Bailey Derrick, president of Delta Delta Delta, said even though her sorority has won the competition many times in the past, the group still gets nervous before performing. 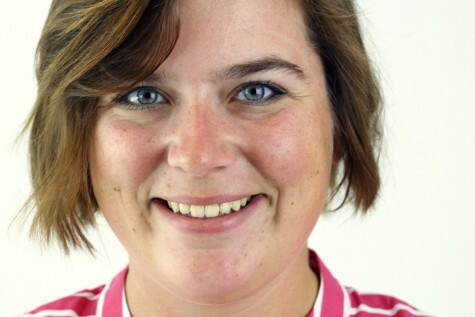 “We felt a lot of pressure because of the long winning streak,” she said. Delta Delta Delta members sang about how they felt like their chapter house was like home. After Greek Sing, the overall Greek Week winners were announced. 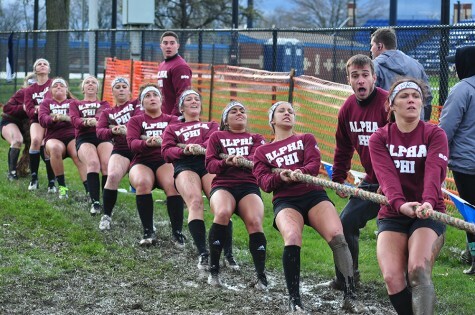 The first place winners of Greek Week 2015 were Delta Zeta and Lambda Chi Alpha; the second place winners were Sigma Sigma Sigma and Sigma Phi Epsilon, and the third place winners were Alpha Phi and Sigma Pi. 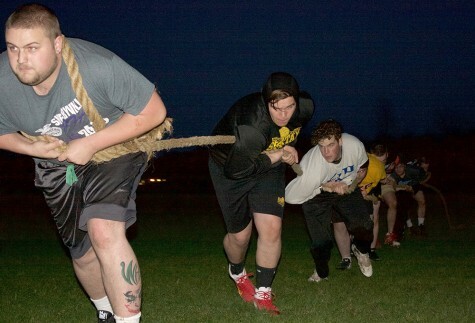 This was Lambda Chi Alpha’s third year in a row to win first place for Greek Week. Dylan Greger, a Lambda Chi Alpha fraternity member and co-chair for Greek Week 2015. 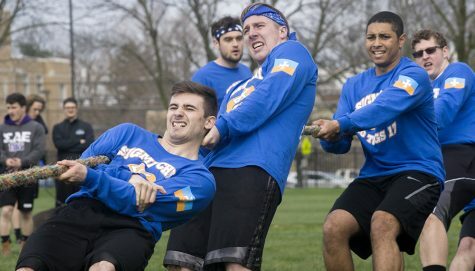 “We are still surprised that we won Greek Week, even more because it is our third year in a row,” he said. He said he cannot wait to see how all three trophies look next to one another in the trophy case in their chapter house. 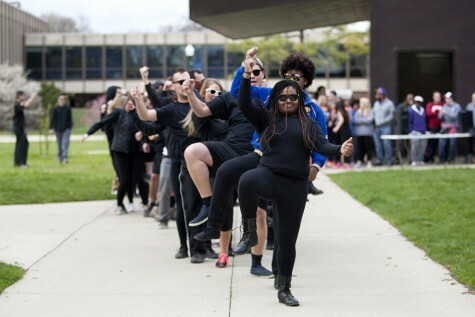 Delta Delta Delta and Sigma Phi Epsilon took first place in Greek Sing, while Alpha Gamma Delta and Sigma Alpha Epsilon took second place. 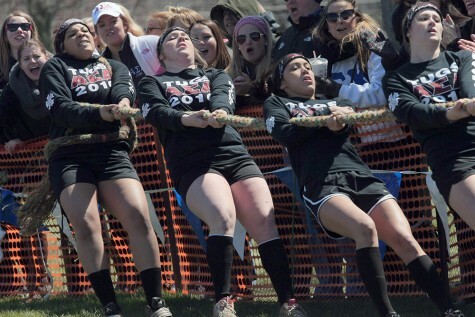 Alpha Sigma Tau and Phi Kappa Theta took third place. Sigma Sigma Sigma was the first group to perform; the group’s topic concentrated on songs from the ‘90s. Members wore black tank tops with matching leggings and plaid shirts around their waists to symbolize the era. Sigma Kappa’s songs used a sweeter approach, as the group performed songs that focused on candy and other treats. Lambda Chi Alpha members stepped on stage with leis looking like they were ready for the beach and sung tropical and summer-themed songs. Phi Kappa Theta followed them singing the Beatles songs. 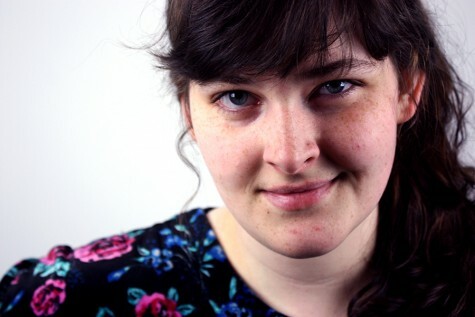 Many sororities and fraternities sang about the tales and tries of love. Alpha Sigma Tau’s songs focused on love and heartbreak during their performance, and Sigma Pi, the group that followed, sang songs of love as well. Sigma Chi’s songs were focused on dancing, while Alpha Phi took people back to the ‘80s with their songs. Sigma Alpha Epsilon took the direction of love in their performance, singing One Direction songs and current popular love songs. Kappa Delta followed them in singing about love in the mindset of a hero. Sigma Phi Epsilon brought love back onto the stage with romantic songs. Alpha Sigma Alpha members decided to be different than other groups and sang about how they were sick of love songs and liars. Delta Zeta was the last group to perform with songs centered on girl power. 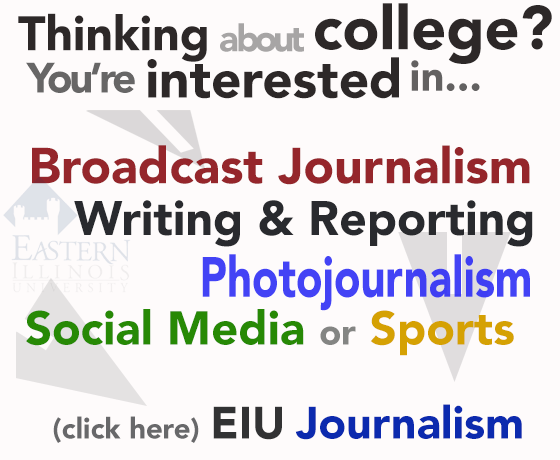 My name is Stephanie White and I am the Entertainment Editor for The DEN for the Spring 2015 school semester and I am a junior journalism major.